awakening spirit, creating health & attracting wellbeing! You have probably been hearing a lot about ‘gluten-free’ lately. I have been 100% gluten free for 7 years! Almost instantly, being gluten-free changed my life! I was symptomatic for about 5 years before that but no doctors could tell me what was wrong. Gluten intolerance or Celiac Disease is when a person’s body cannot tolerate or ‘process’ gluten, which is a protein found in wheat, barley and rye. Here is a precise definition http://digestive.niddk.nih.gov/ddiseases/pubs/celiac/ if you’re interested. The biggest change in my life was that I basically stopped eating processed foods (yay! ), and my symptoms subsided. I am NEVER tempted by ‘glutenized’ food…it’s poison to my body. I hear that some people can tolerate small amounts, but I cannot. Many people are learning that they or their children have issues with gluten. Do not despair!! I am so excited to report that there are so many gluten-free options available today!! 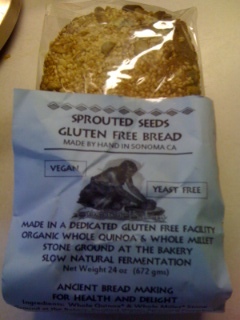 For example, my favorite breads are: Grindstone Bakery, of Sonoma, CA~ Sprouted Seeded Loaf (Quinoa & Millet loaf + Sprouted Seeds (Pumpkin, Sesame, Sunflower). I am lucky because my local Whole Foods carries this bread, but you can order it here https://bear.he.net/~grindst/epistore/index.php?category=Gluten+free. It’s best sliced and toasted! It’s interesting to read about the care Gindstone takes in hand crafting their bread…. “There is no commercial yeast present in our breads. The leavening power is achieved by the use of a long fermentation by wild microorganisms. Fermenting this way takes longer, but the bread develops all the good flavors of the grain, a dense crumb and a wonderfully satisfying chewiness. Our fermentation cultures are the result of years of capturing and experimenting with different combinations of the wild yeast and lactic acid bacteria naturally present in the microbiologically, and otherwise unique environment of the region’s vineyards, farms an wildlands. If you are looking for something that is more like a sandwich bread (although not organic) that kids would like, try Udi’s sandwich bread and Rudi’s also has a tasty cinnamon bread. I am able to find these two brands at local grocery stores. They also carry pizza crusts, bagels, sweets, etc. Whole Foods also has a line of gluten-free baked things. If you would like your local grocer carry gluten-free items, speak to them. I spoke to the owner of our fabulous local grocery, Mill Valley Market, David Canepa, http://www.millvalleymarket.com/about stocking and notating gluten-free products. They now have a whole section, with products to bake your own breads, sweet treats, etc. So thank you David! 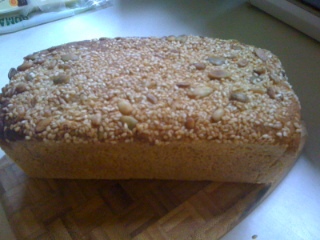 My favorite item I get there is Chebe Bread mix http://www.chebe.com/so I can make my own pizzas! I make the crust (just add oil, egg and water) then top with greens from the garden, a little sauce, goat cheese…yum! Even one of my favorite local restaurants, Piazza D’Angelo~ Mill Valley, CA, Executive Chef Partner Massimo Covello , has recently made the commitment to offer a gluten-free menu! That takes commitment and understanding (he has to create gluten-free areas for food prep, etc.) They are serving gluten-free breads from Mariposa Bakery (artisan-crafted gluten-free breads out of Oakland, CA http://www.mariposabaking.com/index.html and gluten-free pastas. Thanks Massimo!! Next time, I will share more gluten-free essentials…until then, be well!!!! *I haven’t figured out why the post is appearing with so many fonts styles and colors…hmmm. A guide to becoming vigorous and with Fashion!